Team, individual and buddy photos are scheduled in the morning, as well as a panoramic photo in the stands at Del Oro High School Stadium of all Placer United players. 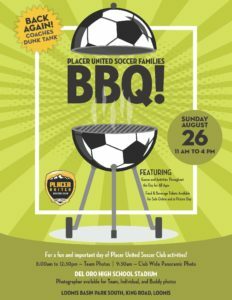 Following the photos we’ll head down King Road to Loomis Basin Community Park (South) for the Placer United Family BBQ. Enjoy bounce houses for the little ones, food vendors, a DJ and activities for all ages. The Coach’s Dunk Tank is BACK! Start working on your aim! Save the date for a fun day with your friends and teammates from Placer United. Please download and complete before arrival to speed things along! Check out the video or photos of one of our last BBQ events and don’t miss out on this year’s fun!